As well make sure to check out our special InfoComm 2014 Newspage for Exhibitor news. The Hi-Fi 2 is a revolutionary distributed audio system. With double the zones, more than double the power, more sources, and an all new keypad with OLED display, the Hi-Fi 2 is reinvented for today's demanding homeowners. Standard 8 Zone, 8 Source System can be expanded to 16 zones and 8 sources; since the components are modular, expansion can occur as needs change. If a smaller system is desired, HAI by Leviton also offers a 4 zone, 4 source distributed audio system. The powerful Hi-Fi 2 plays music from devices you already own (or those you wish to purchase), and is so easy to operate that anyone can enjoy it. With Hi-Fi 2, you have the ability to listen to different sources at the same time at different volume levels throughout your home. Or set all zones to the same source and volume. 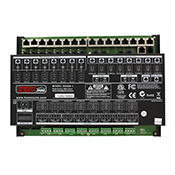 The model PRX-2 is designed to be mounted directly to standard single-gang wall box, and integrates both a 125KHz proximity card reader (supports Viking PRX-C, PRX-C-ISO, PRX-FOB and certain legacy HID® proximity protocols*) and keypad into a single-unit making it ideal for applications requiring an access credential and/or personal identification number (PIN). The proximity card reader and keypad of the PRX-2 both transmit data in 26-Bit Wiegand format, making it compatible with any of the Wiegand equipped Viking entry controllers. The keypad is based upon cutting-edge, non-mechanical, capacitive technology, which, unlike membrane keypads, includes no moving parts prone to early failure. Advanced keypad enhancements include fully potted circuit board (EWP), keys with blue LED backlighting, raised key outlines and pip on the 5-key. The EREN Series comes complete with integrated cooling fans and lockable, removable side panels, allowing for organization of multiple electronic components while providing essential thermal management, as well as protecting them from damage and theft. Rugged and sturdy with welded steel construction and ships full assembled, a black powder coat finish, and a 1,000 lb. load capacity, the EREN-18 includes 18 rack spaces, the EREN-27 includes 27 rack spaces, and the EREN-42E includes 42 rack spaces. $679 – $859. Measuring 1.87 inches, the design elements of the SmartMount® DS-VW755S were incepted to uniquely complement ultra thin displays, providing the option to install a video wall system that protrudes no further than 4" from the wall, making the solution ADA compliant. The Made-in-the-USA mount also offers installers ease of service with the ability to seamlessly align displays. While most mounts on the market require the use of tools, the SmartMount® DS-VW755S offers simple, tool-less micro adjustments at eight points. Tedious calculations and onsite guesswork are also eliminated for installers as the SmartMount® DS-VW755S offers reusable display-dedicated wall plate spacers. For ease of service, the mount is equipped with a quick release function that allows installers easy access to displays in recessed applications that would otherwise be restricted. With the SmartMount® DS-VW755S, the display can also extend into a negative tilt position for ease of cabling, a feature not offered by any other mount. The SmartMount® DS-VW755S Slim Video Wall Mount’s universal design and small 20" x 20" footprint also allows for the mount to be used for both portrait and landscape applications, providing the ultimate flexibility for use in a variety of digital signage applications. D-Tools iOS-based iPad® companion app for its flagship product, SIX 2013 adds mobile quoting capabilities that enable Commercial and Residential integrators to generate quotes natively on an iPad, then import them into the full D-Tools SIX 2013 software platform for further project design and management. Delivering on D-Tools’ commitment to streamline product updates and enhancements by consolidating them into an annual release, this new companion app will immediately extend the highly functional D-Tools workflow to mobile sales and specification teams. Mobile Quote leverages D-Tools’ extensive manufacturer product library by enabling integrators to access and integrate product category and package data from their SIX 2013 catalog while working with customers in the field. Integrators can enter client and contact information into the iPad app, then walk prospective customers through available installation scenarios to create quotes for approval. Once complete, the quote can be imported into SIX 2013 for additional design work and synchronization. Mobile Quote uses many of D-Tools’ workflow concepts, including the locations and systems specifications, allowing integrators to provide packages or pre-configured systems for inclusion in the quote. Labor and general pricing is calculated to give the customer accurate proposals, which can then be signed off for approval on the spot. The Gefen DVI over CAT6 with Galvanic Isolator sends DVI up to 40 meters in distance using a CAT-6a cable or up to 30 meters in distance using a CAT-5e cable. Mountable sender and receiver units connect the source to the extended location using a single cable. Video resolutions are supported up to 1920×1200. Gefen includes galvanic isolation for sensitive installation environments such as medical or healthcare-related fields. It provides up to 5kV of isolation between the source and connected downstream equipment. Without galvanic isolation, the physical connection between the two could increase the risk of electric shock or potentially cause system damage. This new technology was developed by Gefen to enable the use of copper cables instead of fiber optic cables in applications where electrical isolation is a must and the signal extension range is short. It provides integrators with an alternative to use more economical cabling in an installation that would previously have required fiber optic cables. The Cable Prowler Pro Test Kit (TCB360K1) includes Cable Prowler™ Tester, #1-8 Network/Tel Test and ID Remotes, #1-8 Push on Coax Remotes, #1-12 RJ45 Data Remote set, Micro USB cable, No-Fault cable – Qty 2, RJ45 Port Saver, RJ45 to Alligator 12 inch, F Female to F Female adapters, F81 (2), BNC Female to F Female adapter, BNC Female to F Male adapter, Durable plastic case, Quick Start Guide, User Manual (online), Warranty Activation Card. The XAP-1500 provides exceptional Wi-Fi performance in a sleek design that allows for unobtrusive mounting on a ceiling, wall, or other flat surface. Combining high output power with leading-edge concurrent dual-band 3×3 MIMO technologies, it delivers superior wireless coverage and maximum data rates-making it a great choice for maximizing coverage in both Residential and Commercial environments. The integrated PoE simplifies installation, requiring only a single Ethernet cable for both power and data. The Wilson Electronics DB Pro™ 4G cellular signal booster improves coverage – including 4G, 3G and 2G data downloads – for subscribers of all U.S. cellular carriers (except Clearwire). For specific information about frequency bands, see below. The DB Pro 4G works with all cellular devices, and supports multiple simultaneous connections across multiple carriers as well. The DB Pro 4G will amplify signal throughout an entire home or office, providing reliable voice and data coverage inside some of today’s energy efficient but cellular unfriendly buildings. With its new HDMI 4×8 Matrix Switch available for purchase, MuxLab Inc. offers a complete family of matrix switches to its customers. With varying project sizes typically in the ProAV market, MuxLab’s line of switches offers a solution to fit installs of any size. The 4×8 Matrix Switch, HDBT, PoE is the big brother to the HDMI 4×4 Matrix Switch, HDBT, PoE, already on the market. The switches are currently being used in installations globally including sports bars, churches, and educational facilities. A 8×8 version is set to release in the coming weeks. As a member of the HDBase-T Alliance, MuxLab’s switches offer HDBT switching via one Cat5e/6 cable up to 230 ft @ 1080p with an HDMI extender on the receiving side. The switches support POE when used with a PoE Receiver. MuxLab offers a full range of HDBT extenders with varying features. A few of the offering include the HDMI Mono Extender Kit with and without LAN and the HDMI/RS232 Extender Kit with PoE. The line of receivers delivers a complete point to point or multipoint structured cabling solution. We.hub is a breakthrough collection of mobile, collaboration video furniture geared to the needs of facility directors in corporations, universities and conference centers. Unlike similar systems, We.hub is a mobile solution whose advanced multi-user technology enables employees, customers, suppliers or students to work together in revolutionary new ways. We.hub units are designed for use in settings from the board room to the break room. In total, there are five unique designs ranging from the compact Rover to the fully conference-capable Atrium. The mid-sized Collabrium is available at a price far below the cost to equip a conference setting with furniture, monitors and technology. We.hub's many configuration options include: on-board battery, built in white boards, exterior pattern/color etc. Made specifically to meet the demands of medium- to large-sized classrooms, corporate meeting rooms, and auditoriums, the company's latest projectors provide up to 5,000 Colorific™ lumens to intensify projections in any professional installation environment. ClearOne's CONNECT Dante bridge provides the compact form factor and ease-of-use necessary to create a scalable audio network, compatible with existing hardware. A simple firmware upgrade will allow CONVERGE products to fully integrate with Dante-enabled network bridges, microphones, and amplifiers. The robust, highly-interoperable Dante solution provides a no-hassle, self-configuring, true plug-and-play digital audio network using standard Internet Protocols on existing infrastructure-without requiring a dedicated network. Some of the largest live events and sophisticated installations worldwide use this technology, which is based on global networking standards, making signal distribution more cost-effective and user-friendly. There are few companies in the world who are experts in designing projection screen surfaces. Most screen fabrics are made by firms whose primary business is manufacturing textiles for other purposes. Draper made a major investment in equipment, expert personnel and research time specifically to offer a line of revolutionary new surfaces that are unmatched by any other screen manufacturer in the world. TecVision™ Engineered Surface Technology is initially offered in six exclusive formulations on Draper tab tensioned and permanently tensioned screens. Three white surfaces are available with gains ranging from 1.0 to 1.8 across remarkably wide viewing cones. Two grey surfaces offer excellent performance under higher room light levels. This unique camera from Talos Security has built in Wi-Fi for wireless connection to your home or business network, IR illumination for seeing in the dark and two-way audio. With the ability to save recordings via Micro SD card storage (SD card not included) up to 32GB, this camera can be used as a standalone surveillance system. View your camera with your Android or iOS device anytime…anywhere. IP Cameras are a fast growing segment in the surveillance market. These cameras are connected to a local area network (LAN) and the video is recorded by a computer or dedicated / centralized, network video recorder. Since the cameras are not restricted by NTSC resolutions, 1 megapixel and higher image devices can be used to collect a greater amount of video detail. IP cameras are ideal for deployment in school systems, businesses; anywhere a network connection is available. The industry's first LMVS Press & Release™ Pop Out Slim Mount from Premier Mounts delivers high-impact performance for today’s market flood of ultra thin displays. This advanced sleek design mounting option showcases the ideal design for a variety of recessed wall or picture-framed digital signage applications. The LMVS features Premier Mounts’ trademarked Press & Release™ access design, which allows for accessibility anywhere on a video wall and offers the highest ROI to integrators and end-users. Installation time is minimalized with the utilization of spacer plates, and service call costs are cut exponentially due to one-person maintenance and ease of access. In mere seconds, just one person is able to correct equipment issues with a gentle press to the display to extend it away from the configuration. No more extensive service calls to remove layers of equipment in order to reach faulty electronics or replace a display, now it’s easy to save time and money by maximizing use of this innovative design.